This is an etching of the Tombs Prison in New York City. Horter died in 1940, so the image is from some time before that. 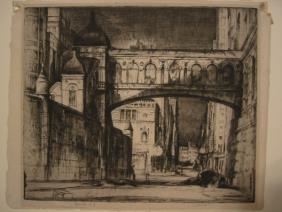 He was known for his etchings of cities, including New York City. This is an excellent image with great plate toning that establishes the dark, oppressive atmosphere of the prison. There is an anonymous dejected figure leaning against the wall near the lower center of the etching. A lone street light just above the figure provides a pool of illumination in the center of the image. It is pencil signed and titled. An excellent image by a great American etcher. The etching is well struck with good inking and tone. The margins are not trimmed. There is a tear in the upper right hand corner that does involve the image. There is tape remnants on both upper corners. There is mild mat burn. No other condition problems are noted.